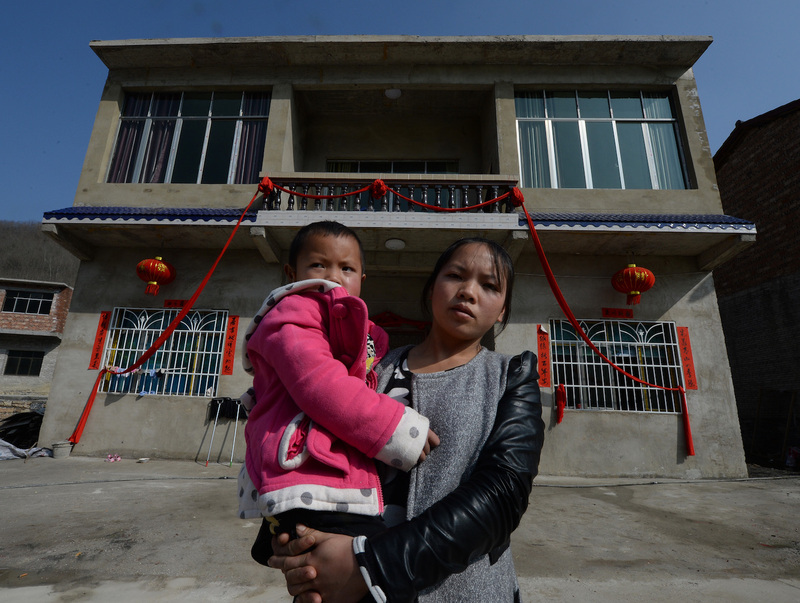 Rural residents stand in front of a new house near the city of Anshun, Guizhou province, on February 20, 2014. Since taking office in 2013, China's leaders under President Xi Jinping have pledged to better integrate the rural migrants who are pouring into cities but are often kept on the margins and denied government assistance. By Feng Hao, a reporter in chinadialogue’s Beijing office. This article was first published by chinadialogue. The province of Shanxi, in northern China, is famous for coal mining, and the industry’s impact is etched across the landscape. But the province’s southern counties, which lie near the Yellow River, are known for a very different commodity—red dates. In 2015, a slump in the market for red dates (known in Chinese as jujubes) became big news in China. In Yonghe County, over 40 million jin (20,000 tonnes) of dates were harvested, but only half were sold around Chinese New Year, the county’s busiest shopping period. Upon hearing the news, Liu Dongdong, a Yonghe native and then university graduate working at a building and decorating firm in the provincial capital of Taiyuan, thought of Taobao, China’s eBay which has around 500 million users. What if people could sell the remaining dates online? Instead of farmers waiting for customers to find them, they could deliver directly to customers’ homes. Liu Dongdong returned home that night with dreams of opening his own online business. E-retail giants such as Alibaba and JD.com have transformed the way people consume in China. The country now has over 500 million online shoppers, making it the biggest e-commerce market in the world, both in terms of number of consumers and total spending—and the market is still expanding. Recently, the state has introduced a number of policies that specifically favor the development of rural e-markets. Analysts predict that the next five years will be a “golden era” for rural e-commerce. According to Alibaba research, the rural e-commerce market may already be worth 460 billion yuan (U.S.$70 billion) in 2016. In China’s villages, people aspire to moving up the economic and social ladder by relocating to a big city. In Yonghe County, the journey starts with moving to Yonghe town; then to Linfen, a prefecture-level city; and finally Taiyuan, Shanxi’s largest city. As more and more young people, like Liu, flock here to the cities to find work, their villages are left to deal with a worsening labor shortage. For Liu, and other graduates like him working in Taiyuan, it’s hard to go home. Poverty-stricken counties, such as Yonghe, suffer from infertile land, poor transportation, high logistics costs, undeveloped industry, and a constant outflow of labor. Liu believes that e-commerce might be part of the answer to saving his hometown’s distressed economy. As well as rejuvenating the village’s economy, it supports sustainable agricultural methods used by the local farmers. These young people, such as Liu Dongdong, are quitting jobs in the cities to return home and give running their own e-commerce business a shot. This has big implications for distressed provincial economies. By luring graduates back to the countryside, the opportunities offered by e-commerce could help reverse the socially and economically damaging effect of “empty nests,” where a region’s working age population moves away leaving behind vulnerable parents, children, and a distressed local industry. At the same time, the trend could take pressure off cities, which are forced to accommodate ever bigger migrant populations, a trend that can involve increased environmental costs than if these migrants had stayed in rural areas. The sandy soil of the Yellow River basin, where Liu’s hometown is situated, is ideal for growing dates. With warm days and cold nights, the earth and climate combine to create sugar-rich dates—almost every household grows some. “It’s not that they’re no good, it’s just not enough people know about them,” he says. Planting and harvesting dates can be backbreaking work. And even after work is done, a good harvest does not necessarily mean a good income. Without buyers for their produce, farmers have no choice but to seek work elsewhere. In the past, 20- and 30-year-olds left for the cities. Now 40- and 50-year-olds, having fallen on hard times, are following them and leaving behind ancestral arable land that often lies fallow. Feng Jianping was born in the 1990s and now runs a store that supplies Taobao. He moved to Beijing at 15. He smiles wistfully as he recalls the hardship of those early days, when he and his wife moved to Beijing, leaving behind his parents and an eight-month-old child. In the four years they spent working in Beijing, the couple would, at most, travel home once every three months. There was no high-speed rail then, and the journey took a whole day. “Looking at my daughter’s eyes every time I left, that was difficult,” he said. The opportunity offered by e-commerce has tempted them back to Yonghe, and now they run an online store selling local specialties such as alcohol, dates, and walnuts. The future of these online entrepreneurs, to an extent, lies in the hands of local government who grant the licenses needed to operate. Much of red tape relevant to e-commerce and agricultural produce relates to food safety. China has endured a multitude of food scares and poisonings in recent decades due to poor regulation and the widespread pollution of air, soil, and water. In October 2015, China’s “toughest ever” food safety law came into effect. It ruled that anyone selling food online—apart from unprocessed agricultural products—must have the necessary license, with the online platform provider responsible for ensuring this is the case. Business premises, equipment, staff, working practices, and hygiene must all meet standards before a license is issued. Zhang Shuwang, an official with the Yonghe Country Food Safety Bureau, told chinadialogue that, “health is no small matter, and food safety rules are getting more and more detailed”. The biggest challenge for businesses on Taobao is meeting the specifications for family-run operations, such as Feng’s, that specialize in foodstuffs. On the plus side, the new Food Safety Law holds independent businesses under its purview—those street-side sellers whose produce doesn’t use packaging or quality-assurance labels. Under the law, these farmers are exempt from the need of a retail license, an allowance which makes their trade to possible. That means Liu Dongdong’s shop can avoid costly, time-consuming requirements to get a license. Within a month of moving back home, his family’s red dates and walnuts were advertised online for sale. Liu ran an e-retail outlet on Taobao selling clothes while he was at university, so he already knew the basics of running an online store. Even in the off-season, he now makes 20,000 yuan (U.S.$3,000) profit a month from selling red dates online—far more than he made working in Taiyuan. After only a couple of weeks, the receipts from the courier form a thick pile. Customers are spread out all over China, from major cities like Beijing, Shanghai, and Guangzhou to small towns in Hainan. Yonghe’s deputy county chief, Cheng Wanjun, said it’s a new way of doing business. Cheng Wanjun has been working to promote rural e-commerce in the area. He told chinadialogue that breakthroughs in rural e-commerce will come from improving products through commercialization and branding. Fostering local companies and personnel and building up their expertise will be crucial to this, he adds. To this end, the county government invited five teachers and 24 students from the Communication University of Shanxi to help with brand design for a soon-to-be-launched Yonghe online store. Villagers who are interested only need to bring their computer and start to learn, at no cost. The classes cover everything from design of branding and packages to sourcing products, running the store, and after-sales service. But Cheng has his concerns: online competition is fierce, and even if the county throws its full weight behind the companies and people involved, businesses might still not make the most of their potential. Furthermore, broadband access is limited once you leave the county town. For example, the village of Lujiaokou to the southwest has 200 households, but only two with broadband. Yonghe is not the only county in this situation. There is a stark digital divide between China’s cities and villages; Internet penetration in rural China is only 30 percent, less than half of that in urban areas. In response, central government has set a target of bringing unlimited broadband to 98 percent of China’s administrative villages by 2020. Li Chang’an, a professor at the School of Public Administration at the University of International Business and Economics, has suggested that construction of network infrastructure in vulnerable regions should be sped up, with connectivity and more Internet skills training for rural workers. According to Alibaba research, county-level e-commerce will require two million trained employees in 2015 and 2016. It seems that it is finding enough qualified workers currently the biggest challenge.